Tucked on the west shore of Lake Tahoe, in the town of Tahoma lies this terribly terrific mountain. 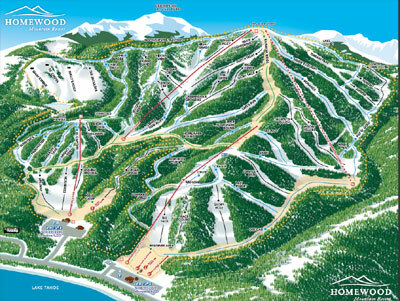 Built right into the side of the mountains, Homewood Mountain resort just blends right in with the community so you may not even know you are there... but boy is the terrain really great. If you're into a quieter, little bit easier day on the slopes, with no crowds, then Homewood is the place. Experience a blue bird powder day on Quail Face, deep powder with spectacular views on The Face, or a peaceful groomer down rainbow ridge.